First things first: What even is Google My Business??? Google My Business (GMB) is a free business listing tool offered by Google. The tool helps businesses and organizations manage their online presence through a simple business listing. It's been incredibly effective for small and mid-sized businesses (SMBs) that often lack the time, know-how, and resources to fully engage in an online marketing campaign. The platform allows you to engage with customers in real-time and take control of the content being displayed on Google search results pages. Local business information is more accurate, businesses are found more quickly, and search results are more relevant for users when business owners have this type of direct access to their listing. Even better, business owners now only have to update their information in GMB, and it will automatically update across the other Google services saving you from having to go in and make changes to every service yourself! Google My Business is accessible to business owners through desktops and mobile devices making it simple to update your business information or review listing performance anytime, anywhere. There's even a feature that allows GMB users to create a free website based on the information in their business listing. If you are a small or mid-sized local business that draws a lot of traffic from local queries (or wants to! ), you want to have a Google My Business listing. Simply put, GMB is the easiest way to get your business front and center in local searches with the least amount of work or financial investment. 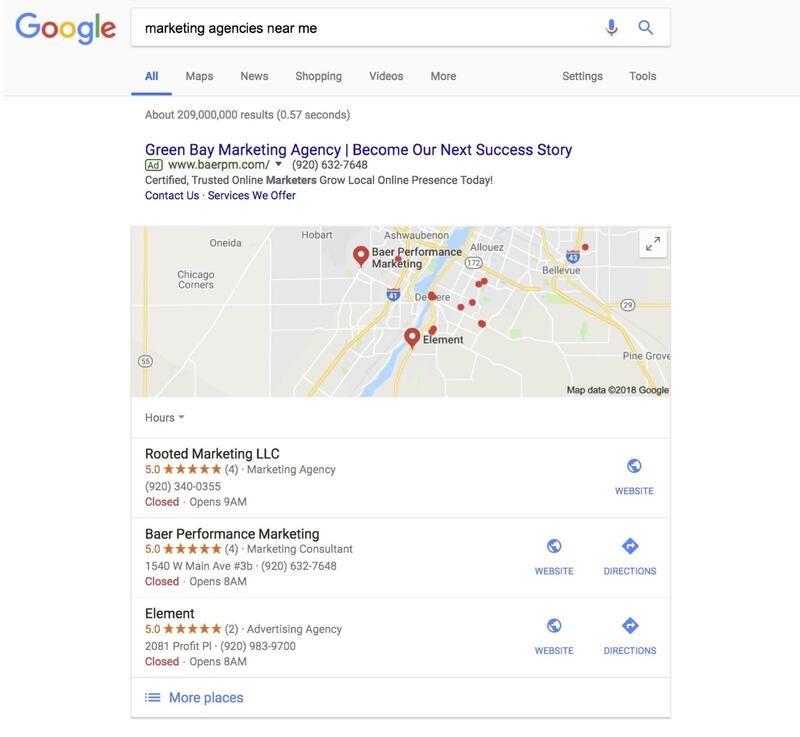 Done correctly, a GMB listing will help your business appear in maps and local 3-pack listings (more on that below), which are becoming increasingly important on search engine results pages (SERPs) and particularly on mobile searches. In 2016, mobile accounted for 60% of all searches; that number has undoubtedly only gone up since then. 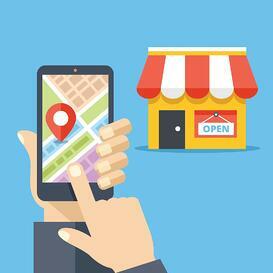 Mobile search is particularly important for local businesses. With smartphones in nearly every household and with us at all times, it's become common to "Google" local retailers and service providers at any time – at home, at work, when we're out and about. Consumers have begun using mobile devices to conduct what we call hyperlocal searches – these are very specific searches in very specific geographic areas. Google My Business helps ensure your business shows up in these highly targeted searches. 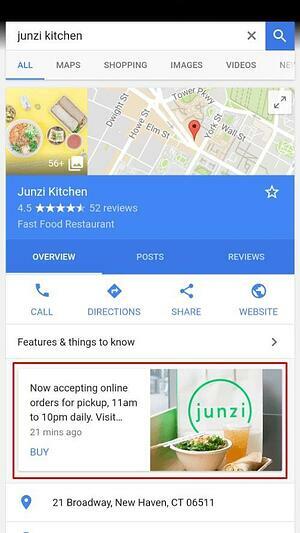 So, when a consumer is out on a Saturday night and wants to know what restaurants are in the area, they can search locally using their phone and Google will return a list of relevant restaurants in a specific geographic area. It works the same way for retail business and even service-based companies. Now, Google can and will return appropriate results even if you don't have a GMB listing, but having a GMB listing gives you an edge over the competition. Google's business listings are created based on several different sources including data you as the business owner enter like business name, address, phone number, etc. But GMB takes it a few steps further than that to also incorporate reviews, third-party links, social media activity, and specific keywords used to describe your business. Google's job basically is to provide the best, most accurate, relevant search results for each search. Determining the best results incorporates a variety of things, not just your location. So, in addition to your address, Google also looks at how you describe your business, what other people are saying about it, and how active the company appears to be online. All of these factors demonstrate a currently open/operating business that fits specific search criteria that may have been used by the consumer like a city name or specific product or service. How Google My Business supports this is by providing the business owner with one single platform through which to provide this data…and since it's operated by Google, you can bet that Google Search is giving that listing a little bit more credence than if you only had a Yelp listing, for example. 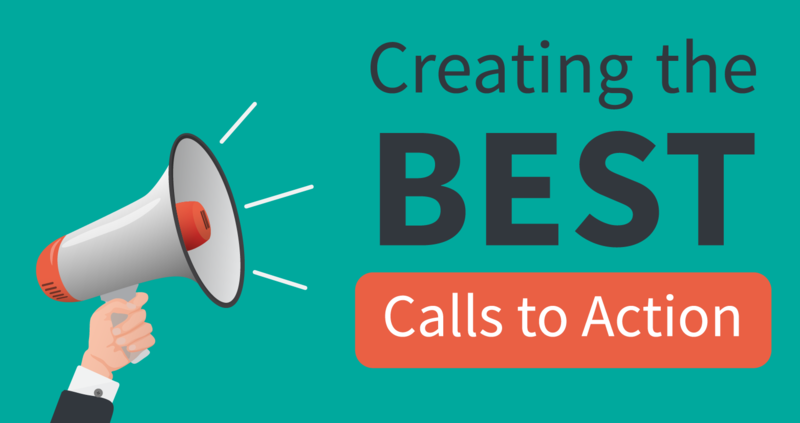 There are many reasons to add GMB to your marketing arsenal. Here's a look at some of our top reasons for recommending Google My Business to local business owners. Local Reach. One of the best things about GMB is its' effectiveness in reaching local audiences. Google is the most used search engine, which makes it an extremely effective marketing avenue on its' own, but Google My Business provides even greater benefits for local businesses by combining information like addresses and hours of operation with reviews, business categories, and keywords to deliver highly targeted search results based on criteria that you decide best represent your business. Cost-Effective. Since it's a free service, GMB is extraordinarily cost-effective - a major plus for SMBs. It just so happens this free service is available from one of the most used search engines on the Internet making the investment well worth the time spent setting up and maintaining the account. Honestly, it does not take that long to set up the account. 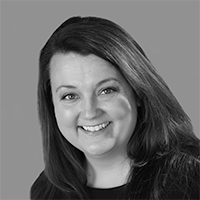 The biggest challenge is making sure your information is complete, accurate, and up-to-date. We love that GMB helps local businesses stand out in searches without having to invest in paid ads. Comprehensive. One of the hardest aspects of marketing your local business online is deciding where to invest your time and resources – and then keeping up with it. GMB combines multiple Google features and services into one platform allowing you to sell products, upload videos, make announcements, list services, and add holiday schedule changes all within a single platform. Because the service is through Google, you reap the added benefit of these features displaying next to your company listing in the SERPS -- in real time. Performance Feedback. GMB includes Insights, which shows you how your listing is being found on the web and what customers do once they find it, this can help you see how your listing is performing whichcan help you decide on new strategies to optimize your listing further. Also, if you use GoogleAnalytics, you can connect it to your GMB account and access that data right from your GMB dashboard. You're in Control. You manage your GMB listing, not a directory service, not a vendor, not Google. This ensures your customers see what you want them to see about your business and it ensures the information posted is always accurate. Search Engine Results Pages (SERPs). 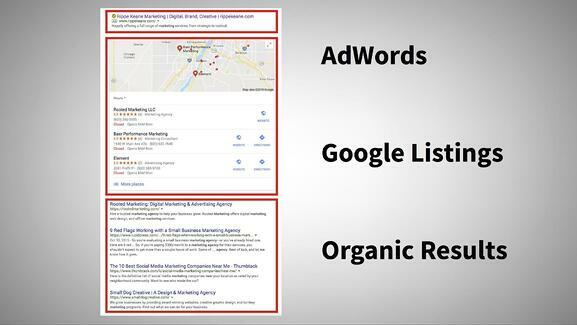 Because SERPs contain data from so many different sources and in different formats like Pay-Per-Click ads, maps, images, reviews, contact information, and social activity, sites are better able to catch the eye of search engines, making your business more visible to local customers. To the right is a look at a typical SERP for Rooted Marketing. As you can see paid ads are at the top (Google Ads), then the local 3-Pack, and finally Organic Results. 3-Pack. We mentioned the "3-pack" above. A Google 3-Pack is a list of three local businesses that meet the specified search criteria. 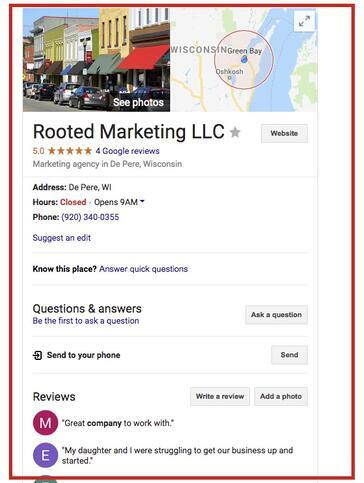 Relevant GMB profiles can appear in this local 3-Pack and in Google Maps results. The 3-Pack includes a simple list of 3 local results along with their locations on a map. This list typically appears right under the Google Ads Pay-Per-Click (PPC) results. The 3-Pack is a great place to be because it is highly visible, provides clear and concise contact information, includes a direct link to your business website, and can be accessed via the map. Businesses are able to sponsor a listing in the local 3-pack, effectively making it a 4-pack. But by claiming and optimizing your listing, you may be able to appear there at no cost. Knowledge Panel. Another way Google My Business boosts visibility is through the Knowledge Panel. The Knowledge Panel provides a quick snapshot of important business information. The data shown differs depending on the type of business. Here's a look at Rooted's Knowledge Panel and the Knowledge Panel for a retail shop. Notice how they differ based on the kind of business. One is a service-based business that does not see customers at the business location, and one is a retail, brick-and-mortar location. We'll get more into service-based vs. brick-and-mortar business later. Unfortunately, simply having a GMB listing isn't enough to guarantee that your business will show up in the Knowledge Panel. Much like search results, what shows up in the Knowledge Panel is determined by many different factors. Search relevance, distance from the searcher, and the prominence of the business all factor into the algorithm used to create the Knowledge Panel. However, providing the most complete and accurate data in your GMB listing is sure to help. Google My Business is full of all of the classic business listing features that consumers are looking for such as: Hours of Operation, Reviews, Photos, Website links, etc. as well as special features such as Google Posts, Book Now, and Chat. Let's take a look at these each in turn and see what you can do with them. Hours of Operation. This feature allows you to include your regular hours of operation, but it can easily be edited to accommodate holiday hours or unanticipated closings. It is so accurate that the listing will show the business as "Closed" if the search is done when you are closed, as in the image below. Again, you can make these changes from a desktop or mobile device, and it will ensure that Google returns the most current information to searchers. Reviews. Reviews and references from customers and third-parties are very important for search engine rankings because they help Google identify which businesses are legitimate, local, and relevant. How do you get reviews? Ask customers to leave a Google Review! They can leave reviews directly from your GMB listing as it appears in search results or you can provide a link. Improve your profile even more by replying to reviews. Photos. Photos are another great way to add relevancy. Whether or not you use Photos depends on your business. Pictures are a great way for restaurants and retailers to showcase products, but they are also useful for hotels and entertainment venues. Both you, the business owner, and your customers can add photos to your listing. Virtual Tour. To give customers a taste of what they will experience when visiting your business, consider a 360 tour. This interactive experience can enhance your online visibility and draw traffic to your business. Website Links. If you have a website, you definitely want to link to it from GMB. Website links are a simple and effective way to drive relevant traffic to your website. The website link is prominently displayed near the very top of the GMB listing. You can link to your existing site or create a free basic website right in GMB. Local URLs. In addition to your website, you can add other URLs. For example, a link to make reservations or place an online order. Directions. Like the website link, this is also displayed right at the top of the listing along with a map. Customers who click on it will be taken to Google Maps where they can get driving directions, find transit options, and more so they can get to your location. Google Posts. Google Posts allows you to post updates, offers, and videos directly to your Google My Business listing. Post daily specials, sales and events, changes to store hours, or any other relevant information that you want to share with your customers. It's a simple way to build relationships with current and soon-to-be customers without having to log in to a whole new app. Here are some tips for creating Google Posts. Book Now. Book Now is one of several "action buttons" that are available to a Google My Business listing. Additional actions include "Get Directions", "Call Now", and "Message Us". All are aimed at making it easier for customers to make contact with you immediately. Chat. This feature allows customers to message you right from your GMB listing. It's an effective way to create a connection with customers who just found you or those who are trying to reach you on the go. As part of the service, Chat will post how long it typically takes the business to respond, so if you're going to add the Chat function make sure you respond to inquiries! 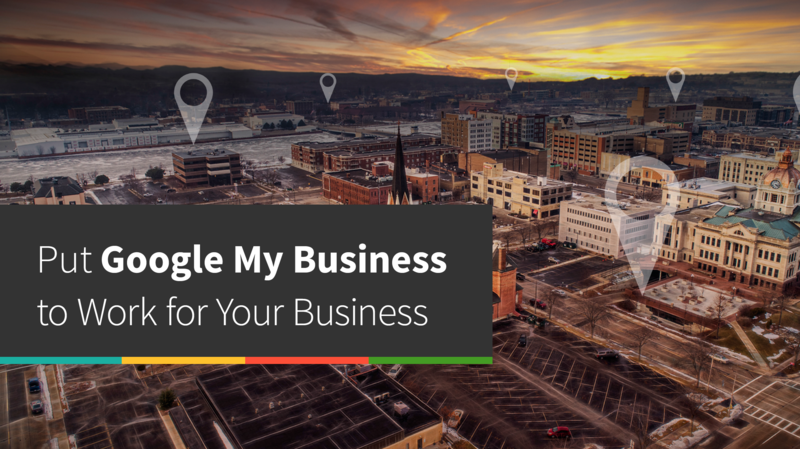 Getting started with Google My Business isn't that much more complicated than setting up a new email account. Visit www.google.com/business and click "Start Now". Service-Oriented Businesses. If you are an online, mobile, or service oriented business that serves customers at their location, list your business as a Service Area Business. You will still need a physical address to use GMB, but you have the option of hiding the address once the listing has been created. In order to hide your address you will need to click Yes to the statement, "I deliver goods and services to my customers at their location". You will then be able to hide your address and set a geographic area in which you provide your services. From your List view, Select the locations you'd like to manage from the List view, then click on the pencil icon to add locations and make edits. Claim your business listing. This is an authorization step that verifies that you are the actual owner of the business and authorized to manage it. You'll receive a PIN either by snail mail or by phone that you will use to verify that you are the owner of the business and access your listing information. We recommend opting to receive the PIN by phone whenever possible. Double check your information. Once you have access to the listing, check that your business information is current and accurate. 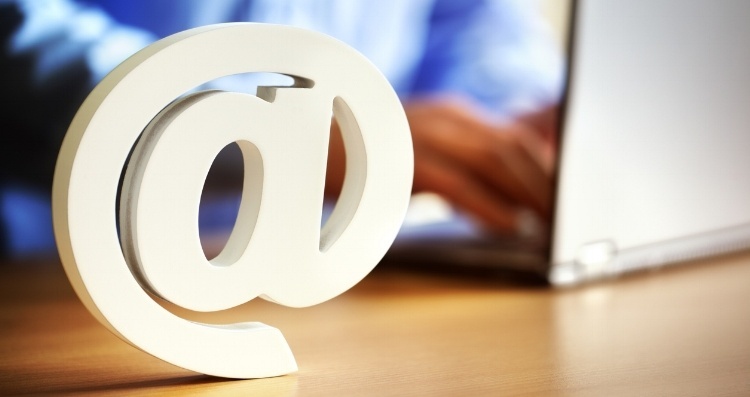 Pay special attention to contact information, operating hours, and your service category. You can choose a primary category and secondary categories to provide more details about your business, but you cannot create your own category. While you're verifying data in GMB, double check that all of your business information is consistent across any other online profiles you may have (Yelp, Bing, industry-specific sites, etc.). Consistent information will yield better search ranking. Add visuals. Add images to your listing to help customers see what you have to offer. Depending on your business you might showcase products or services, your building, staff members, or awards. Choose images that make you stand out from the competition. Add reviews. Ask customers to review you on Google. Reviews are very important to customers, helping them to sort through all of their choices. Your company's star ranking will show up next to your name and address in the "3 pack" listing. Category Selection. You can select up to 10 categories for products and services you offer. Specifying your categories can help your listing appear in the Search Engine Results Pages for searches that are most relevant to your business. Create a Company Overview. Google My Business allows roughly two paragraphs to describe your company. Be should include keywords and describe your company, history and the services offered. We are often asked whether or not service oriented businesses can or should use Google My Business. In the past, they couldn't, but now they can and they definitely should. 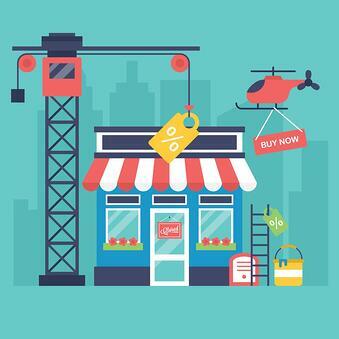 GMB offers three types of business listing categories: Service Area, Storefront, and Brand. Service Area businesses have no storefront and do not see customers at the business location. Storefronts are traditional brick-and-mortar businesses that service customers at the store's physical location. Brands do not usually affect local businesses as the business is required to be global in order to utilize the Brand category. Now that all types of businesses can use GMB, they should. As we mentioned above, there are ways to manage your listing to hide your physical address if you don't see customers at your location and still show up in the 3-pack and SERPs. 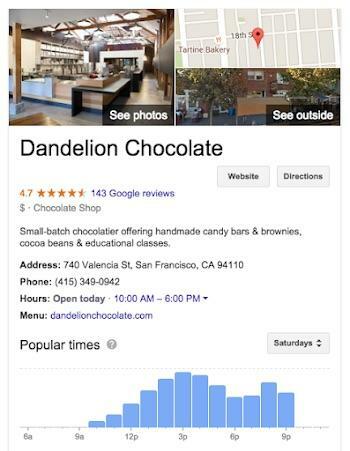 Google provides more detail about accurately representing your business via GMB, here. Two things we can't stress enough are the importance of maintaining and optimizing your Google My Business listing! This is not a one and done kind of thing. It's a marketing avenue, and like all marketing tactics, you'll need to keep tabs on it to make sure it's still working for you. To maintain your listing, we recommend adding the GMB app to your phone. Versions of this App are available both in the Google Play Store and in the App Store. This app makes it easy for you to respond to inquiries quickly. Today's consumers expect quick answers. If you don't get back to them quickly, they'll move on. They also expect websites and listings to be current. So be sure to continue to update the listing with reviews, images, and content, like posts. Optimizing goes hand in hand with maintaining the listing. Even though the business is listed through Google, you'll still need to provide cues for the search engine to pick out your listing when a customer does a search. You can do this by adding keywords in strategic places. Keywords are the "key words" or important words or phrases in your GMB listing or website that help searchers/customers find your business online. These are the words a customer would type into a search engine to bring up a search engine results page (SERP). Google and other search engines try to connect the customer or searcher's keywords with the keywords found in web content to deliver accurate search results to the searcher. Your job as the business owner is to figure out what keywords your customers are or might use to find your business or similar businesses online. Then, incorporate those words into your GMB listing, your website, your social media posts, etc. – anything you post online should contain some of your identified keywords, but there's no need to go overboard. Google's search function has become so refined over the years that it can now pick up on natural keywords and phrasing. So, don't worry about stuffing your content with keywords; just make sure a few keywords are sprinkled in and you are headed in the right direction. The first place you'll have a chance to optimize your GMB listing with keywords is when you are setting it up. You'll have to choose a service category and subcategories. Unfortunately, these are not customizable in Google My Business. You'll have to select the category that best fits your business for the Category, then use the subcategories to refine the business category. For example, a grocery store will likely choose "Groceries" as their main Category and then refine their listing by adding subcategories like "organic groceries", "grocery delivery service", or "Indian grocery store" as well as any other subcategory that are relevant to the business. The more specific you can be in these subcategories, the better. Specifics increase your chances of ranking because they weed out the competition. "Groceries" is a highly competitive keyword and you may not rank at all if that is your only category, but once you add a subcategory, Google is able to refine the results. The more subcategories added, the more refined the results and the less competition you'll have for ranking. You should also try to add keywords to the description you are able to enter for your business. Filling out your GMB profile as completely as possible. Pay special attention to NAP (Name, Address, Phone) and make sure all information is accurate and current. Using a local phone number and make sure it matches the number on your website or landing page. Using your actual business name. Making sure your business listing information is accurate and up-to-date. Check operating hours, payment methods, website address, name, etc. Refresh, replace, or update photos from time to time. High-quality images are best. Ensure your business information is current on other listing sites, services, and directories like Yelp, the BBB, the local Chamber of Commerce, Bing and Yahoo, etc. Regular use of your site (i.e., maintaining it!) will also catch Google's eye. Reviews are good. Responses to Reviews and Chatting are good. Shares are good. Fresh images and Posts are good. All of this helps optimize your business listing without too much effort on your part. Google offers a lot of features in GMB, make the most of them for better results! We can't stress enough what a terrific service Google My Business is for SMBs and particularly local businesses. As consumers rely more on voice search and their phones to conduct those searches, search results are inevitably becoming more focused on local services, solutions, and answers. Plus, you get to tap into the power of Google for free! Google My Business is ideal for new businesses, those are just getting started online, those who have a limited budget, or those that want to boost their online profile. If you have tried Google My Business, we'd love to hear your feedback! How has the service worked for your business? Are you using all of the features or some more than others? What's your take on Google My Business?